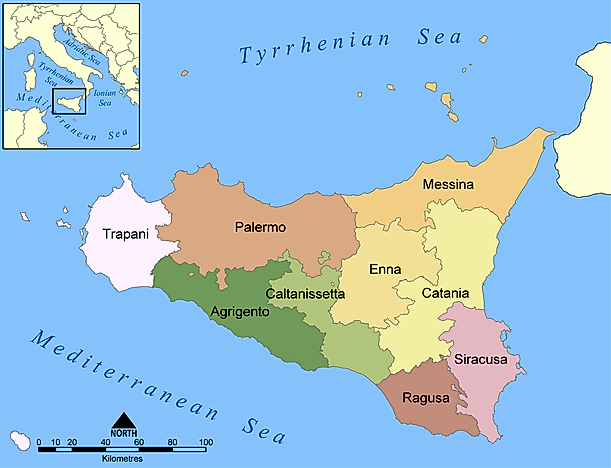 The two largest Mediterranean islands, Sicily and Sardinia, are both controlled by Italy. Thinking of the Mediterranean Sea brings to mind images of deep blue waters and rocky shoreline cliffs. This sea is home to a large number of beautiful islands that embody various cultures and countries. For some, these islands are home; for others, they are glorious vacation spots. The Mediterranean is surrounded by Europe, Asia, and Africa and is connected to the Atlantic Ocean via the Strait of Gibraltar. This sea has over 150 islands varying in size and below are descriptions of the biggest of these islands. Without a doubt, Sicily is the largest island located in the Mediterranean Sea. The 9,927 square miles belong to Italy. The geography of Sicily is full of rolling land with tall volcanoes overlooking the agricultural landscape below. This island experiences mild, wet winter and hot, dry summers which are typical of the Mediterranean. Inhabitants come from Roman, Spanish, Greek, French, Albanian, Norman, and Swabian descent (to name a few). The most heavily populated city is Palermo with 1,044,169 people. Another Italian island makes the list at number 2. Sardinia is 9,300 square miles and has long coastlines of high, rocky cliffs. The interior of the island is covered in lakes and mountains. Like Sicily, the climate is typical to the Mediterranean region. The people of Sardinia are considered an aging population and exhibit a low fertility rate (less than 2 births per woman). The largest city, Cagliari, has a population of 154,460. Still large, but significantly smaller than its Italian counterparts, is 3,572 square-mile Cyprus. After a decades-long battle over land ownership between Turkey and Greece, Cyprus gained independence in 1960. This island nation and has a population of approximately 1.1 million and residents here enjoy the varying landscape and excellent weather. This country is home to 2 mountain ranges and the plains area between them; the climate is subtropical in nature. The two biggest communities are individuals of Greek and Turkish descent. While they share many things, like food and drink, their differing religions, Greek Orthodox and Sunni Muslim, has kept them from more closely uniting. Continuing down in size, Corsica comes in at number 4. This French island boasts 3,350 square miles and only 322,120 residents. Less developed than other regions in France, the Corsican economy relies mainly on tourism for survival. An interesting fact regarding Corsica is that Napoleon Bonaparte was born here! Fifth place belongs to Crete, which is 3,206 square miles of Greek territory. Though smaller in land area than Corsica, the population is almost double. Crete is home to 623,065 people. The residents take pride in their heritage, and it is not uncommon to find men dressed in traditional clothes like knee-high black boots with the pants tucked in and a black shirt. A sign of masculinity is to have a big mustache. Of the next five islands, four belong to Greece. Those are Euboea (1,422 square miles), Lesbos (630 square miles), Rhodes (541 square miles), and Chios (325 square miles). The only Spanish island on the list is Majorca with an area of 1,405 square miles. It is a popular tourist destination. On each of these islands, tourism plays a vital role in the economy. The number of tourists that Mediterranean islands receive every year is more than double the number of permanent residents! The high rates of tourism, however, has a huge impact on the natural resources of the islands, particularly on the freshwater. Because of this high demand and consequent overuse, the groundwater has become saltier and requires increased treatment. Mediterranean tourism is only expected to grow, and it is up to these island governments to ensure it becomes more sustainable for the environment.